“I have no more conditioner,” my 4th grade daughter reminded me as I dropped her at school last week, her hair looking frizzy, as she grabbed her book bag, kissed me goodbye and ran into school. I mentally added it to my list of things to do and dreaded the day ahead filled with mundane errands and deadlines. Duane Reade, check. Out of cereal and other necessities, stop at supermarket, check. Bring play date home, check. Squeeze in gym, check. Spend about three hours coordinating family schedule, check. Not happy. Feeling stuck again. Time to arrange my fantasy sports car test drive! One of the things on my “52” list was to drive a great, luxurious, impractical, expensive, “dream” car — a Ferrari to be exact. How cliché right? For years, experts have used the sports car as a symbol of the typical male mid-life crisis. It was perceived as a selfish, impractical purchase often made by men when they are freaking out at a certain age. You know, the little red sports car. Well, I felt the need for speed, impracticality, just having fun and skipping the errands one day last week. Okay, okay, so I am a little young to have this midlife “buy a ridiculous car feeling” (and I am female! ), but all I wanted to do this year was try driving one — push the pedal to the metal. And I did. In fact, I am not alone. Hard data shows that men and women are not so far apart in their car-coveting habits after all. A Los Angeles–based automotive-industry consulting group, Auto Pacific, says that 41 percent of women who will buy a car this year will consider buying a sports or luxury car, versus 47 percent of men. And trust me: these women are not using them for carpooling. My fantasy ride was not easy to arrange. In August, while out of town, I tried unsuccessfully to test drive a Ferrari (see my post); even when I was back in NYC I had a hard time setting up a day to do this. 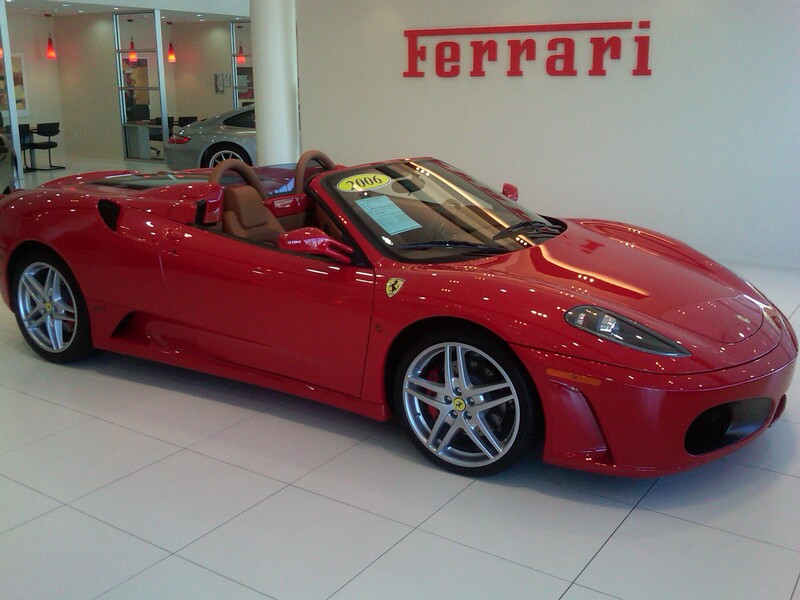 Did you know there are only 34 Ferrari dealers in the entire country? I didn’t. Many of them are also strictly showrooms and test driving is impractical in places like New York City. Or, they “don’t have any on the lot” to test because they are low in inventory and don’t deal in the kind of volume that a more practical car dealer would. And that wasn’t my only concern. To be completely honest I was nervous about the manual transmission thing too. I mentioned this to my husband who despite his thousands of hours at work somehow manages to read about cars. You see, I know it’s lame but I am an “automatic” transmission girl. Vague memories of trying to drive my High School boyfriend’s car (a beat up Nissan I think) with a manual transmission came flooding back to me. If I wasn’t good at it at “fearless-17” I was definitely going to be more hesitant many years later. But I was determined to master it this time. Then my husband chimed in: “They all have paddles now on the steering wheel,” he stated. “Anyone can drive them with the paddles.” “Paddles? “What are you talking about, paddles on the wheel?” I was clueless and had no idea what he was talking about, envisioning boating oars jutting out of the dash or from the side of the wheel. I was all psyched up to feel like a real driver with a stick shift and a sports car. The paddle revelation was a bit of a bummer to be honest. The stick shift was part of the allure (or so I thought). Where have I been that I didn’t know about this? I’ll tell ya: cut-off from real-car fun in my boring “Mom” SUV with my automatic transmission and Disney Radio playing Selena Gomez or Justin Bieber every time I’m in the car! Further research revealed that Bieber himself owns a flat back Ferrari 420! How ironic. How annoying. He’s 16! So after numerous calls, I finally found a dealer up in Spring Valley, New York that was ready, willing and able to deal with me (brave guys). Wide World Ferrari Maserati is a great place. 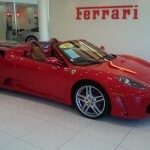 The Showroom sparkles and is filled with red Ferraris of all kinds. There is even a Ferrari clothing section near the front — proof that women had to be coming in at least once in a while! Unfortunately I only got to look at the Ferrari California (the one they had was being repaired!) but I couldn’t take me eyes off of it. Billed as the “more feminine” Ferrari, I sat in it, stared at it and fantasized a few moments. I then bee-lined to the F430 (the one replaced by the Ferrari Spider 458 that I wrote about). Loved it. It had that engine in the back that you can see through fiberglass. I imagined speeding along in this amazing looking car. “Nope, can’t take that one out either,” my Ferrari guy said to me. “It’s just for show. When you called we had others here.” Maybe he wasn’t so nice after all? Maybe this wasn’t meant to be. But then he said, “What about that Maserati Convertible over there? You can take that out and get a feel for the paddles and have a great ride. 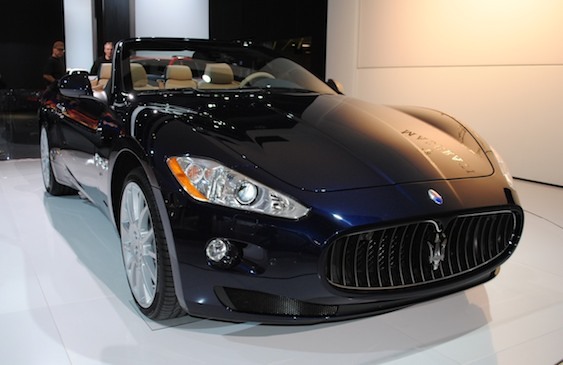 And it’s a Maserati. Try it.” I reluctantly agreed – dreams of my Ferrari drive dashed. It was a Maserati GranTurismo Convertible. Could I feel, for a few moments, like a “bad girl” (bad woman?) in this car? Will this give me that feeling that I am seeking? It was pure luxury. I read later in CelebrityCarsblog.com that the GranTurismo’s top-quality beige-colored leather emits the appearance of a high-roller. “Celebrities love to be photographed whenever they are stepping out of their cars, and the interior will match any smile and swag the celebrities might have.” Okay, they are right. Gary (Ferrari guy) sat patiently in the passenger seat as I hesitantly pulled out of the lot and onto the road. A few minutes later we were on the highway and I was getting more comfortable. And there they were: the paddles. Gary showed me how to shift and I felt the power of the car. It was a hot day and the convertible top was down and I never wanted to go back into my “Mom” SUV again. And you know what? The paddles were kind of cool. You feel the shifting and your hands don’t leave the wheel. “That’s why professional race car drivers like them,” my husband added later. “You don’t lose time shifting.” I really didn’t care about that. I loved the dash (it was almost a little retro) and it felt like a sports car without being that extreme, male, mid-life crisis-screaming red sports car.